You might not be aware of it, but there is an entire community of gamers out there who try to run through games as quickly as possible, by whatever means necessary. These speedrunners are regularly breaking each other’s records, even for games that are decades old, but it’s still exciting when it happens, especially with a classic game as popular as Super Mario World. 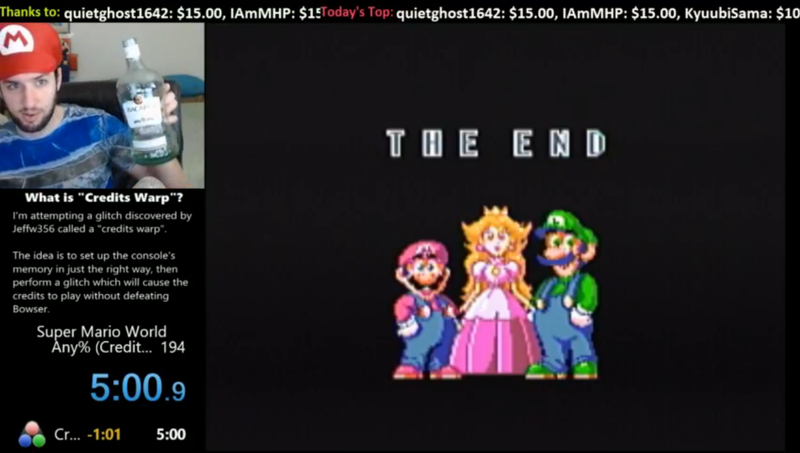 This week, SethBling (as he is known on Twitch), beat Super Mario World in less than six minutes using what is known as the “credits warp” glitch, a glitch which has never been done on a Super Nintendo console before. By doing so, he set a new world record for the game, which he then broke again hours later. Without getting too technical (mostly because I don’t understand it myself), Seth effectively rewrote the code of the game using in-game items in order to warp himself to the end credits without ever beating a single level. This has been done on emulators before, but never on an actual legitimate copy of the game on an SNES. As several Redditors have pointed out, Seth actually accomplished this trick just minutes after another speedrunner beat the world record for the game without using the glitch. You can watch that run, from GreenDeathFlavor, on Twitch.